A small town in the west. At an end of the big street, five or six palm trees rise above the thatched roofs like a mute man’s signs to the sky. Next to the derelict house, an ancient tamarind tree puffs up its dense, glistening foliage like clumps of green cloud. Young goats move about on the ground of this roof-less house. Behind them, the lushness of the forest range spreads across the horizon of the afternoon sky. Today, rain has completely withdrawn its dark cloak off this town’s head. I have a lot of important things to write—those remain unwritten. I know this would be a cause of regret in the future; let that be; I would have to accept that. One can never know or stay prepared for the moment when or the form in which wholeness emerges, but when it does, one can’t welcome it empty-handed. At that moment, the one who discusses loss and gain must be a smart calculator and would do well in the world; but dear vacation of light in the midst of glum ashadh (1), in front of your momentary bright, cloud-less glimpse, I put to dust all my important activities—today, I won’t make calculations about the future—I am sold off to the present. One day follows another, none of them demands anything of me; the calculations don’t go wrong then, all work happens smoothly. In such times, life progresses by linking one day to the next, one task to another; everything is uniform. Suddenly, when a special day appears without informing, like a prince from across the seas; a day unlike any other, all the trail of the days past is lost in an instant—that day, it becomes difficult for routine work to proceed. This day, though, is our big day—this day of irregularity, this day of ruining work. The day that comes and defeats our everyday is our day of joy. The other days are for the intelligent, the careful, and this one day is for giving ourselves completely up to madness. Mad isn’t a hateful word to us. We worship Nimai (2) because of his craziness; Maheshwar (3) too is our lunatic god. The West is debating as to whether talent is only a form of developed craziness—but here, we don’t feel ashamed to accept this as true. Inspiration is, of course, craziness, it is an exception to the rule, it comes only to upset order—it emerges all of a sudden—like today’s haphazard day—and destroys all the work of working people—some curse it, some others go crazy, dancing and delighting with it. Bholanath (4), who remains as the joyful one in our scriptures, is one such oddity among all deities. I see that mad lord amidst the flood of sunshine shining through this day’s washed blue sky. His tabour plays steadily within the heart of this thick afternoon. Today, death’s naked pure face stands still in the middle of this work-filled world—with beauty and peace. Bholanath, I know you are strange. In every moment of life, you have appeared with your begging bag. And completely wrecked all calculations and measurements. I am familiar with your Nandi (5) and Bhringi (6). I can’t say that they haven’t given me a drop of your intoxicating beverage; these drops have inebriated me, everything has been upset—today nothing is in order for me. I know that happiness is an everyday item, but bliss is beyond every day. Happiness remains constricted, fearing it may get dirty; bliss rolls over dust and shatters its separation with the universe; that is why to happiness, dust is inferior, but for bliss, dust is an ornament. Happiness is afraid of losing something; bliss is delighted to relinquish everything; for this reason, to happiness, emptiness is poverty, but to bliss, poverty is abundance. Happiness carefully protects its grace within the confines of order; bliss openly expresses its beauty in the freedom of destruction; this is why happiness is bound to outward rules, but bliss breaks those bounds to create its own rules. Happiness waits for nectar to arrive; bliss drinks the poison of sorrow with ease. For this reason, happiness is partial to only good, but for bliss, good and bad are no different. It is not as if this mad lord of ours appears only at certain moments; in creation, his madness is always at work; we only get a glimpse of it in certain moments. Death is forever making life new, bad is brightening good, and the inconceivable is giving value to the trifle. At the moment we get such a glimpse, the freedom within the form becomes evident to us. Today, amid this cloudless light, I see that amazing face. That road across, that thatched-roof provisions store, that broken house, that narrow by-lane, those trees and vegetation—I used to see all these with the pettiness of everyday familiarity. That’s why these had confined me—had kept me in house arrest within these daily images. Today, all of a sudden, all the pettiness is gone. On this day I see that for so long I had been viewing the unknown as familiar; my seeing wasn’t clear at all. Today, I can’t finish looking at all these. Today, all of these things surround me, yet they don’t imprison me, they all make way for me. My madman was here only—that spectacular, unknown wonder, who did not ignore this thatched-roof provisions store—only, I didn’t have the light before my eyes with which to view him. What is amazing about today is that these nearby images have acquired for me the glory of a far-off place. The impenetrability of the snow-capped Himalayas and the impassability of the wave-ridden ocean express their fraternity with the madman. In this way, one day we suddenly realise that the one with whom we had established a familial relationship remains outside our family. The one whom we had taken to be readily available in every moment is actually rare and hard to get. Those, around whom we had drawn a boundary thinking we knew them well, appear to have acquired a marvellous mystery by crossing all boundaries. The same one who, when viewed from the side of rules and balance, appeared rather small, quite regular, very familiar, when viewed from the side of breach, from the angle of that graveyard-roaming madman, turns me speechless—amazing! Who is that! The one whom I have always known is now this, who! The one who is part of the home on one side belongs to the heart on the other. The one who is important to work on the one hand is completely outside all necessities on the other. The same one whom I touch on the one hand is, on the other, beyond all grasp. The one who has managed to fit well with everyone is, at the same time, a total misfit, absorbed in self. Today I saw the one whom I don’t see every day. In so doing, I gained freedom from every day. I thought I was bound by the everyday rules within the fence of familiarity surrounding me. Today I see, I have been forever playing on the lap of grand wonder. I thought that I had been making my daily calculations under the sharp gaze of a big officer in the office. Today, at the roaring laughter of the miscalculating madman—who is bigger than the big officer—reverberating through water, land, sky, air and the entire universe, I heave a sigh of relief. My workbook remains untouched. I lay down the pile of my important work at the feet of that capricious madman—let the blow of his Tandava (9) smash it into pieces and blow it off as dust. 2. Nimai: A prominent saint of medieval Bengal and the founder of Bengal Vaishnavism. Also known as Chaitanya Mahaprabhu. 3. Maheshwar: Another name for Shiva, a major Hindu deity. The god of destruction. 4. 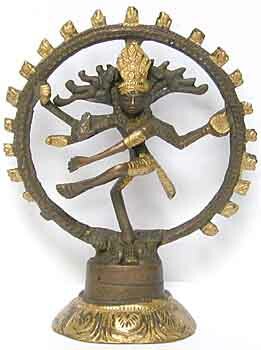 Bholanath: Alternative name for Shiva. 5. Nandi: Shiva’s vehicle, a bull. 6. Bhringi: Originally a demon who was transformed by Shiva into a humble devotee and admitted into his force as a commander of his armies. 8. Yagna: A Hindu ritual, dating back to Vedic times, carried out to please gods. Oblations are poured into sacrificial fire, as everything that is offered into the fire is believed to reach the gods. 9. 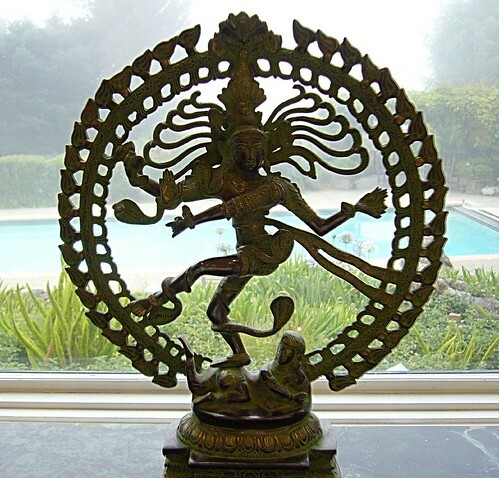 Tandava: In Hindu mythology, Shiva’s Tandava is a vigorous dance that is the source of the cycle of creation, preservation and dissolution. Hey, so this post is a lot more recent than your other blog's post.Beautifully written, as always. Beautifully written. Are you are a writer by profession? Shoo! Lovely piece. Please say something to me to spur me on to continue writing my nephew's biography that I started in 2007. Sometimes I feel my language is too simple to make interesting reading. "Happiness remains constricted, fearing it may get dirty; bliss rolls over dust and shatters its separation with the universe"This is a precious essay, Bhaswati. Thank you. Bhaswati, may you always be happy! he is indeed a lucky man.My only news is that I've sold my novel. Dear Nalin, Thank you so much for stopping by at this blog and for your kind words. I am touched. I hold The Telegraph in high regard and find your blog very interesting (will link to it too). True, this blog has been dormant, but I can assure you, it isn't dead. I hope to start posting soon again. Good to be in touch with you. I like what you wrote about the differences between happiness and bliss. This feels true. Glad it touched a chord with you, Lindsay. And thanks for dropping by. Your blog looks lovely!